The writer (Karunesh) has picked up an episode from history, a very known story especially after it was highlighted in Rang De Basanti, and given it his own little twist and spice if I might say. The interesting plot revolves around the bonding that two of our freedom fighters, Ram Prasad Bismil and Ashfaqulla Khan, shared as they plotted India’s fight for freedom contrasted against the fictional story of their accidental friendship as children. The play presents 2 parallel stories. First is the one of a young Hindu boy, Ram (played by Anuj) though hostile towards Muslims, somehow through the game of “Kanche” finds a close friend in Ashu (played by Saurav), a young Muslim lad, new in the neighbourhood. Parallel runs the story of Ram Prasad Bismil (Shreyansh) and Ashfaqulla Khan (Karunesh) who each find their love for poetry along with their common passion for India’s freedom that drives them to new plans to save Indians from the atrocities of the British. The first few scenes do extremely well in establishing each of the characters – Ashu is shown to be really playful and at times mischievous while Ram and Ashfaq each bring out a very serious character from the very beginning. As the story progresses, one begins to spot the similarities between Ram and Ram and also between Ashfaq and Ashu, and as the play draws to a close, it shows that Ram and Ashu are indeed the childhood of Ram and Ashfaq. 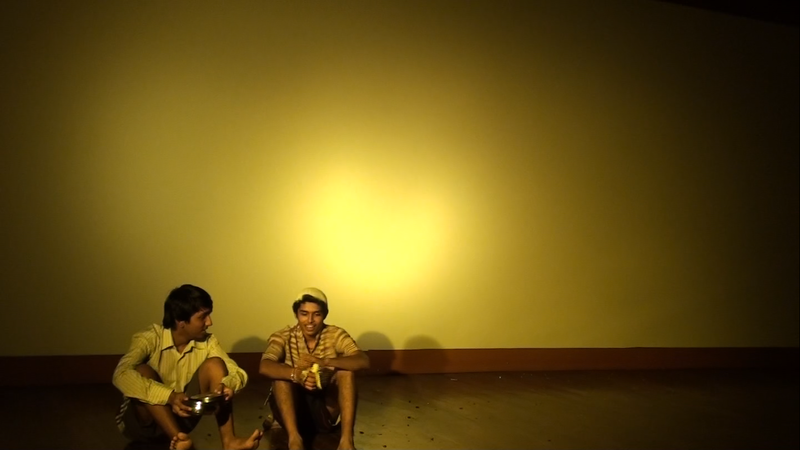 The flow of the play and the characters displayed by the actors show that Karunesh has put in considerable effort in doing research on the characters and content of the play. Another noteworthy thing was how meticulously it was ensured that each dialogue of Ashfaq was in Urdu, and those of Bismil were in Hindi. A special mention needs to be given to Shreyansh, whose brilliant body language, especially while narrating the poems, delivered an added impact to these patriotic poems. A few points the play could have improved upon: the costumes of the actors who played the child roles seemed a little out of place, the lighting of the entire play was slightly on dimmer than expected as the actors’ face could often not been seen clearly and a little more effort needed to be put into stage design. But overall, a very brave attempt on the part of these sophies and one of the better plays of the night in my opinion.